Two pixels enter. One pixel leaves. > Also, does the submission have to be open source?... or are we able to just put binaries on a publically accessible GitHub? The code for all of the entries must be published in a public GitHub repository, but you can license it however you wish. If there are any 3rd party (or your own) libraries / assets that you don't want to add, that's fine. I'd recommend leaving a note in the README.md file that descrives the dependencies / omissions. > If you submit an App, does it have to be in the store?... or can ppl side-load the apk for instance? Nope. As long as someone is able to play / download the game via the itch.io page, you're good. Everyone who submitted a game is eligible to vote. Each game will be rated on a 1-5 scale across the following categories: Overall, Gameplay, Graphics, Audio, Innovation and Theme Interpretation. Everyone on the team can vote. No multiple rounds. Voting ends on Dec 22nd at 13:37 PT. No patches allowed during the judging period to the itch.io page*, but you're welcome to push changes to the repository (as the code isn't being judged). There will be winners across all categories. There are no official prizes for the Game Off. * if there's a bug that seriously affects people being able to play the entries that is a "quick fix", I've permitted those in the past. Just leave a note of what was changed and why in the itch.io page. > Also, with regards to the [Theme Interpretation] judging category, am I missing something, or of the 44 submissions only like 4-6 deal with the [Hybrid] theme.?. Are the ppl submitting just going to take a loss in the [Theme Interpretation] judging category.?. That's quite possible. The entry pages should have a sentence or two from the creators about how they interpreted the theme. Since the code isn't being judged, you're welcome to keep pushing updates to the GitHub repository. However, please hold off publishing any changes to the itch.io page until after the judging period ends. I'll add this to the FAQ - thanks! Hi - if anyone missed the deadline, simply email me with a link to your game and I'll share a unique URL with you - lee @ github.com. You're welcome to use whatever kind of license you wish! Simply add the appropriate `LICENSE.txt` or `LICENSE.md` to your repository. Game Off 2018 community · Replied to PlanetKiller in No rules? Unfortunately, games created prior to Nov 1st won’t be considered valid. Game looks great though - keep at it! > Can we use Unity or Unreal Engine? > Can we use pre-made assets? Absolutely, although many people will create their own. I'd recommend adding some attribution in your GitHub repository's README. > Can we use pre-made code? > Can we sell the games (for the jam or post jam)? > Is there a twitter hashtag? > Are games allowed if they contain 18+ content? No restrictions on content, but if it's something I wouldn't show my kids or grandparents... then it may be less likely that it'll appear on our blog :) Please also see itch.io's note on adult content. > What are the voting categories? Similar to last year, games will be rated on the following: Overall, Gameplay, Graphics, Audio, Innovation and Theme Interpretation. > What kinds of licenses are required/accepted for the public GitHub repo? You're welcome to use whatever kind of license you wish! See this documentation for tips on choosing / applying a license. > Can I edit the game after the submission period? Please don't change the game on the itch.io page until after the voting period ends. If there's a bug that seriously affects/prevents playability that's a "quick fix", please feel free to address it. Just leave a note on the itch.io page saying what you changed and why. Since the code is not being judged, you can update the GitHub repository any time. Game Off 2018 community · Posted in No rules? Absolutely, although many people will create their own. > Not so much a rule, but is there a twitter hashtag? The official hashtag is #GitHubGameOff. Similar to last year: Overall, Gameplay, Graphics, Audio, Innovation and Theme Interpretation. Please let me know if you have any other questions. I'll consolidate all of these into a FAQ and make a sticky post shortly! The game can be any size and even unfinished and yes, Clickteam Fusion is perfectly fine. It can be private. As long as it's public when you submit, you'll be good to go. Note: nobody will be judging the code. Great question - yes - I'll make the clearer on the landing page. Game Off 2018 community · Posted in What is the most prefer platform to beginners? If it means more people being able to play (and rate) the games, I think it's perfectly acceptable if you add support for additional platforms. I'd recommend making a note of it on the submission page (or devlog if you're using that feature). I'd recommend holding off on uploading new builds until after the judging period ends. If it's to address something seriously broken / preventing people from playing I think it's fine if you just make a note of it in the submission page. Game Off community · Created a new topic Voting is now open! Game Off community · Posted in How to submit a multiplayer web game? I might be able to offer some advice. 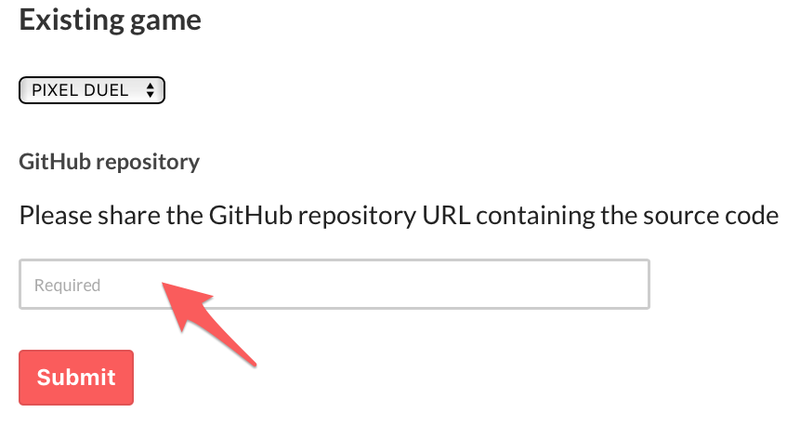 Can you share the URL for GitHub repo(s)? and the URL where the game is currently running? Game Off community · Posted in Old rep, new project! Game Off community · Posted in Is a new branch instead of new repo okay? Game Off community · Posted in Cant find games tab? Just wanted to let you know that I'm seeing your game in the submissions. (It looks awesome!) All of the entries will be viewable once the jam ends. Hi Nick - that's absolutely fine. Game Off community · Posted in How do we affiliate our repo with our submission? Game Off community · Posted in Rewriting a game thats already being worked on? Hi there - thanks for asking! As much I'd love to be able to say yes, I don't think that would be in the spirit of the jam. Game Off community · Posted in Limit on Number of Entries? Just as an FYI, people have come up with fun ways to work in multiple games into the same entry e.g. http://js13kgames.com/entries/26-games-in-1. Game Off community · Posted in [SOLVED] Unable to run Godot on OSX. Can anyone help? I'd recommend pinging them directly in one of their support / communication channels via https://godotengine.org/community. Best of luck!